Verisign has had its false advertising lawsuit against the .xyz gTLD registry thrown out of court. XYZ.com this week won a summary judgement, ahead of a trial that was due to start next Monday. “By granting XYZ a victory on summary judgement, the court found that XYZ won the case as a matter of law because there were no triable issues for a jury,” the company said in a statement. The judge’s ruling does not go into details about the court’s rationale. XYZ’s motion to dismiss has also not been published. So it’s difficult to know for sure exactly why the case has been thrown out. Verisign sued in December, claiming XYZ and CEO Daniel Negari had lied in advertising and media interviews by saying there are no good .com domain names left. XYZ said its ads were merely hyperbolic “puffery” rather than lies. Verisign also claimed that XYZ had massively inflated its purported registration numbers by making a shady $3 million reciprocal domains-for-advertising deal with Network Solutions. While Verisign has lost the case, it could be seen to have succeeded in some respects. XYZ had to pay legal fees in “the seven-figure range”, as well as disclose hundreds of internal company documents — including emails between Negari and me — during the discovery phase. Through discovery, Verisign has obtained unprecedented insight into how its newest large competitor conducts its business. While I’ve always thought the lawsuit was silly, I’m now a little disappointed that more details about the XYZ-NetSol deal are now unlikely to emerge in court. Did XYZ.com pay NetSol $3m to bloat .xyz? Evidence of a possibly dodgy deal between XYZ.com and Network Solutions has emerged. Court documents filed last week by Verisign suggest that the .xyz registry may have purchased $3 million in advertising in exchange for $3 million of .xyz domain names. Verisign, which is suing .xyz and CEO Daniel Negari over its allegedly “false” advertising, submitted to the court a list of hundreds of exhibits (pdf) that it proposes to use at trial. Gorrin is Web.com’s senior VP of marketing and Negari is Daniel Negari, XYZ.com’s CEO. The documents these headings refer to are not public information, and are not likely to be any time soon, but they appear to refer to on the one hand XYZ billing NetSol for $3 million in domain names and on the other NetSol billing XYZ for $3 million in advertising. Only one of the two document headings is dated, so we don’t know how closely they coincided. The emails Verisign cites were dated May 2014, shortly before .xyz went into general availability June 2. What we seem to be looking at here — and I’m getting into speculative territory here — are references to two more or less simultaneous transactions, both valued at exactly $3 million, between the two parties. Both companies have consistently refused to address the nature of their deal, citing NDAs. As you recall, the vast majority of .xyz’s early registrations were provided by NetSol, which pushed hundreds of thousands of free .xyz domains into its customers’ accounts without their explicit consent. The number of freebies is believed to be about 350,000, based on comments Negari recently made to The Telegraph, in which he stated that .xyz, which had about 850,000 domains in its zone at the time, would have 500,000 registrations if the freebies were excluded. With a registry fee roughly equivalent to .com’s (.xyz’s is believed to be a little lower), 350,000 names would work out to roughly $3 million. Negari has stated previously that every .xyz registration was revenue-generating, even the freebies. Is it possible that NetSol paid XYZ’s registry fees using money XYZ paid it for advertising? Is it possible no money changed hands at all? I’m not saying either company has done anything illegal, and it’s completely possible I’m completely misunderstanding the situation, but it does rather put me in mind of the old “round-trip” deals that tech firms used to dishonestly prop up their tumbling revenue at the turn of the century. Back in 2000, the dot-com bubble was on the verge of popping, taking the US economy with it, and companies facing the decline of their businesses came up with “creative” ways to show investors that they were still growing. AOL Time Warner, for example, “effectively funded its own online advertising revenue by giving the counterparties the means to pay for advertising that they would not otherwise have purchased”. Regulators exercised their legal options in these cases only where there appeared to be dishonest accounting, and I’ve seen no evidence to suggest that XYZ or Web.com unit NetSol have failed to adhere to anything but the highest accounting standards. Again, I’m not saying we’re looking at a “round-trip” deal here, and there’s not a great deal of evidence to go on, but it sure smells familiar. Certainly, questions have been raised that Verisign did not raise in its initial complaint. On a personal note, I’d like to disclose that among the documents Verisign demanded from XYZ are dozens of pages of previously confidential emails exchanged between myself and Negari. I’ve read them, and they’re mostly heated arguments about a) his refusal to give details about the NetSol deal and b) my purported lack of journalistic integrity whenever I published a post about .xyz with an even slightly negative angle. XYZ had no choice but to supply these emails. I can’t blame it for complying with its legal requirements. I wasn’t the only affected blogger. Mike Berkens, Konstantinos Zournas, Rick Schwartz and Morgan Linton also had their private correspondence compromised by Verisign. I don’t know how they feel about this violation, but in my view this shows Verisign’s contempt for the media and its disregard for the sanctity of off-the-record conversations between reporters and their sources. .xyz starts to plummet — NetSol freebies to blame? XYZ.com has been seeing its .xyz zone file shrink rapidly over the last five days, likely as a result of free domains pushed out to Network Solutions customers starting to expire. DI PRO stats show that .xyz has shrunk by 49,658 domains this week — today at 888,413 names compared to a June 4 peak of 942,927. It was June 4 last year when the industry become aware that NetSol was automatically pushing .xyz names into the accounts of its existing customers without their explicit consent. Renewal rates usually do not become clear for 45 days after expiration, due to grace periods, but domains can delete earlier. On June 9, 2014, one year ago today, .xyz had 87,073 domains in its zone file. It’s difficult to see where a loss of almost 50,000 names this week could come from if not the NetSol freebies deleting. It is believed that the NetSol giveaway contributed about 350,000 names to .xyz’s zone over the period of its offer. NetSol has been bundling .xyz renewals — which along with the free year of email and privacy comes to a whopping $57 — when it asks its customers to renewal their matching .com/.net/.org domains. .xyz likely hasn’t seen the worst of its total shrinkage yet. When eNom pushed free .info domains into its customers’ accounts about 10 years ago the renewal rate on those names was virtually zero. Network Solutions is charging a total of $57.17 for renewing the .xyz domain names and associated services it gave away for free as part of .xyz’s controversial launch last year. A little over a year ago, NetSol found controversy when it pushed hundreds of thousands of .xyz domain names into its customers’ accounts without their explicit consent. The offer, which required customers to opt out if they didn’t want it, included a year of private registration and a year of email. The move allowed XYZ.com, the .xyz registry, to report itself as the largest new gTLD registry. It’s been the subject of some speculation how renewals would be treated by NetSol, but now we know. Customers, at least in cases reported by DI readers, are being sent renewal notices for their .xyz bundles in the same mailshots as for their .com domains. Clicking the “Renew” button in these emails takes registrants to a NetSol page on which they can select which of their products they would like to renew. All, including the .xyz products, are pre-selected for renewal but may be deselected. Pricing is set at $15.99 for the .xyz domain, $15.99 for the private registration and $25.19 for the email service. That’s a total of $57.17. 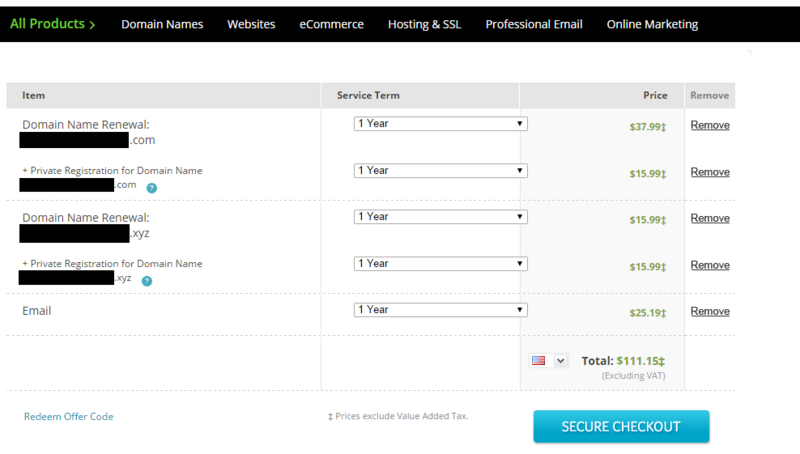 Here’s a screenshot of the shopping cart with the pricing (I’ve redacted the domain). Click to enlarge. We want to show you how much we appreciate your loyalty by rewarding you with complimentary access to a 1-year registration of a .XYZ domain, one of the hottest new domain extensions. .XYZ domains are proving to have broad appeal and also be extremely memorable. In addition to your complimentary domain, you’ll also receive Professional Email and Private Registration for your .XYZ domain – free of charge. If you choose not to keep this domain no action is needed and you will not be charged any fees in the future. Should you decide to keep the domain after your complementary first year, simply renew it like any other domain in your account. Offer applies to first year of new registrations only. The offer is not transferable and is only available to the recipient. After the complimentary first year the .XYZ domain name and its related services shall expire unless you actively renew the .XYZ domain name and its related services at the then-current rates. Please note that your use of this .XYZ domain name and/or your refusal to decline the domain shall indicate acceptance of the domain into your account, your continued acceptance of our Service Agreement located online at http://www.networksolutions.com/legal/static-service-agreement.jsp, and its application to the domain. There’s concern from some registrants that customers may renew their .xyz services without really understanding how they ended up in their account in the first place. .xyz currently has over 857,000 domains in its zone file. XYZ.com CEO Daniel Negari was recently quoted as saying that roughly 500,000 of those were not freebies. The company is being sued by .com registry Verisign for using its reg numbers in “false advertising” that seeks to compare .xyz to .com. Top registrar Web.com is seeing disappointing revenue from its domain business due to new gTLDs. The “increased availability” of names has taken a chunk out of the company’s premium domain sales, CEO David Brown told analysts on the company’s third-quarter earnings call yesterday. While we continue to expect the recently expanded top-level domain environment to increase our ability to sell domains over the medium to long term, the increased availability of names has had a near-term negative impact on domain-related revenue. This is primarily associated with non-core domain-related revenue such as sales of premium domain names and bulk domain sales. The company blamed about half of the reduction — about $5 million — on softness in its domain name business. We’ve seen that market get soft…. The reason the softness is occurring is that this marketplace is looking at all of these new gTLDs coming into place, there are more options available for people and they’re kind of stepping back away, at least temporarily, to see how things settle out. He said the company expects the market to come back after the uncertainty has passed. Web.com yesterday reported third-quarter net income of $33.9 million, up from $29.3 million a year ago, on revenue that was up to $137.4 million from $125.2 million in 2013. The company, which owns brands including Register.com and Network Solutions, announced a $100 million share repurchase at the same time, to prop up the inevitable hit its stock was to take. Its shares are trading down 25% at time of publication.